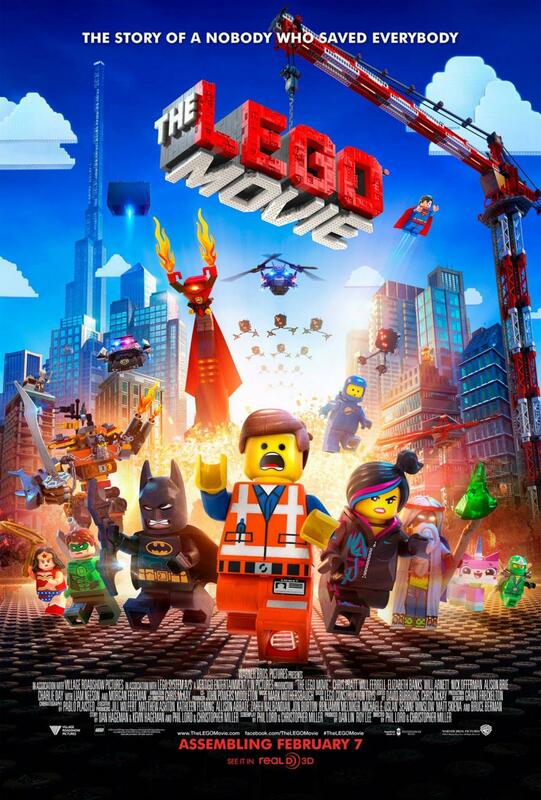 The Lego Movie: Everything Really Is Awesome! 1. Young children. If your kid is old enough to sit through a film without running around the theater, then they are old enough to love this movie. I went on a rainy day with kids all over the place, and they seemed to be completely caught up in the story. In the screening I went to, at one point a little kid in the theater loudly yelled “No!” just as the movie character did – he was that into it. But it’s not intense or scary, and it’s squeaky clean, so even very young children can go. Even kids too young to follow the plot will love seeing all the plastic figures flying around. 2. Older children. I went with two ten-year olds. They were ecstatic. They were old enough to get the humor and the story thrilled them. 3. Jaded teens. OK, I haven’t field tested this on a jaded teen yet. But while they’ll leave the theater with you saying, “Yeah, whatever, I guess it was OK, can I go now?” they’ll love the meta aspects of the movie – which are legion. 4. Grown-ups. I can’t remember the last time I went to a movie and had so much fun. I literally shrieked with laughter. The opening sequence in which Emmet, our Everyman/Lego gets ready for the day and goes to work has so many jokes crammed into it, both verbal and visual, that I wanted to watch it over and over again – and the movie rarely slowed down after that. The closest thing I might compare it to is the sequence in which Mike and sully get ready for the day and head to work in Monster’s Inc. The whole movie is visual madness but I never lost a sense of scale or physicality. The jokes are meta and marvelous. The end is touching in a way that truly surprised me. I don’t think anyone I went with saw the end coming, and that’s a rare thing in a movie these days. I thought it was somewhat rich that the movie spends a lot of time trashing the big business mentality when Lego is, of course, a big business, as is the movie studio. But one of the things I liked about the movie is that it had a certain balance at the end. Someone on TV Tropes pointed out that the movie praises originality, but the more inventive designs fall apart easily, like they would if you built them from pieces from different sets with no regard for symmetry or structure. Emmet is able to combine originality with knowledge of instructions, so he brings a combination of chaos and order to the Lego world. I thought that was an amazing insight – thank you, TV Tropes! I try not to read reviews before I write my own, but I couldn’t resist reading some for The Lego Movie. What I found is that all the reviewers find something else to talk about. The movie isn’t just visually layered but also thematically layered. So you can talk about how the movie both subverts and applauds the Hero’s Journey, or the attacks it makes on big business, or it’s treatment of imagination and skill as things to be treasured and nurtured. You can talk about parenting, or the value of friendship, or you can talk about this movie as toy commercial, and whether maybe it’s saying that all those care flu kits Lego marketed for years were missing the entire point of what makes Legos fun all along. Look, there’s nothing not to like about this movie except that you might have some sensory overload and you’ll spend the rest of your life humming the song “Everything is Awesome” until your head blows up. Even the tragedy of your exploding brain is a small price to pay for the joys of this movie, which packs on such an array of mayhem that I’m pretty sure everyone on the team was really drunk on Vodka and Red Bull the whole time. But it’s not just empty visuals. We really care about the characters and what happens to them. And there’s some pretty sharp (and very funny) satire in there. This movie is smart, and emotionally involving, and subversive, and did I mention smart? If, by any chance, you’re one of those people who can’t believe a movie about Legos could be any good, do yourself a favor and just go see it. Trust me. This entry was posted in Movie and TV Reviews and tagged film review, Lego, Lego Movie, movie review. It’s OK with me. We’ll never tell anyone that your grandson is a cover for you. SHHH! IT”S A SECRET!! !